EINE NACHLESE [THE AFTERMATH]. HERAUSGEGEBEN VON MAX EISLER. Klimt, Gustav. Vienna, Österreichische Staatsdruckeri, 1931. Limited edition of 500 copies. 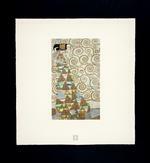 An uncommon and unusually decadent portfolio of prints after original oil paintings by Gustav Klimt. Complete sets of this portfolio are becoming increasingly scarce. Preserved in the original folding case, this set remains in superb original condition.